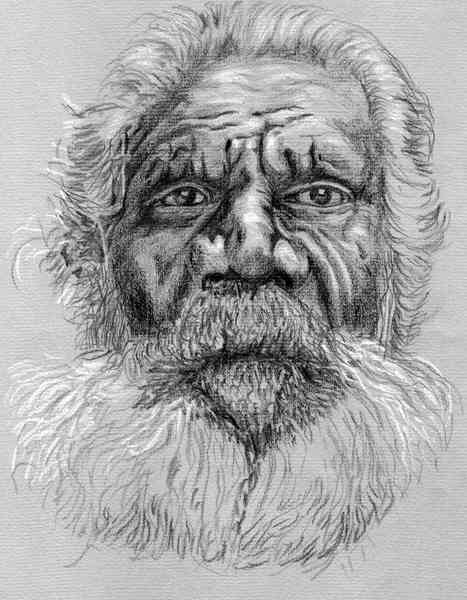 Charcoal sketch - Aboriginal elder from Peppiminati, Northern Territory, Australia. A few years ago I was wandering around the Merrepen Arts Festival, (formerly the Daly River Mission) on the banks of the Daly River, Northern Territory. I got talking to a middle aged lady who was basket weaving, and then I asked her about the old guy with her, (her father) who couldn't speak any English. We had a short conversation via the daughter and he told me that he was from Peppiminati about 50Klm away in the region of the Moyle river. The old guy had a look of dignity and inner strength, so with his permission I took his photograph and from that shot I did this drawing. The technique is very old, any book on drawing will show this style of drawing, using a tinted paper, (in this case Ingres paper with a ribbed surface to provide a tooth for the charcoal), as the mid tone, charcoal as the darker tone and the highlights picked out with white chalk. For anyone visiting the NT I would highly recommend a visit to one of our major aboriginal arts festivals. They are absolutely great, the dance, the music the artworks, all are so vibrant and full of life. The locals show so much infectious enthusiasm for the events that a visitor can't help joining in.